Dear All, My name is Prakash V and I have been a resident of Bengaluru for the past 25 years. Currently, I am doing everything possible to help my 20 year old cousin brother who is suffering from Blood Cancer. My cousin Vishal Ballal is a young talented cricketer who has played and performed well in the under 16 and under 19 tournaments conducted by the KSCA. 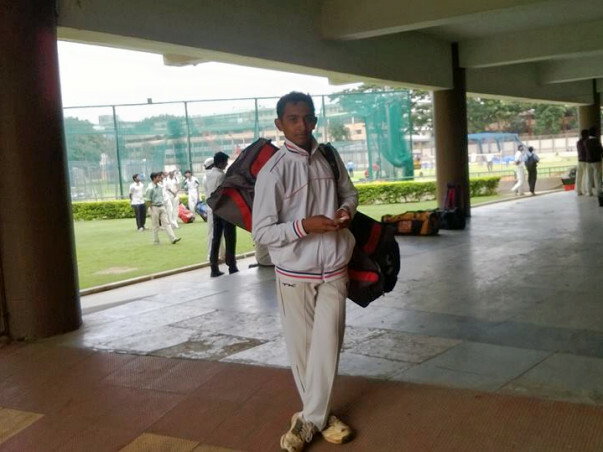 His record shows his talent, and the youngster has plans to play for the Ranji and the country soon. But fate has been cruel to him. Unfortunately, he is diagnosed with Blood cancer (AcuteMyeloid Leukemia AML – M3). We have admitted him to the Columbia Asia referra lhospital in Yeshwantpur. The doctors claim that his treatment would cost us Rs12 -14 Lakhs. His father work as a driver and his wife is a clerk at a private school and they cannot afford such money for treatment. We are helpless, but want to save him. I request everyone reading this to kindly help us financially or pass on the message to someone who might be able to help. My cousin is a talented cricketer and we need your help to save him. In this situation, every penny counts and please go ahead and donate whatever you can. It will certainly help us and we will be thankfull to you. The above is Vishal's photo. We are also trying to raise money through friends, relatives and well wishers, but we are falling short by a long margin. You can mail me on prakash.v@tv9.com and I will provide all paper cuttings / certificates related to his cricket performance over the last few years and also the letter and other documents from the hospital indicating his disease and the cost to treat it. Every single rupee donated to him will be used only to treat his disease. It gives me immense pleasure in informing you all that Vishal is doing very well now. He has also started playing cricket and recently flew to Sri Lanka to play a match. He is currently on observation, meaning, his health is being observed closely. He gets a blood test done every three months. The doctors have told us that he needs to be monitored for any irregularities for five years post his treatment. Two and a half years have already passed and there haven't been any alarming episodes yet. We are all hoping the next two and a half years to also go smoothly because if he has a relapse, then he will have to undergo a bone marrow transplant. Thank you everyone once again! We're forever indebted to you. Here is the latest update with regard to Vishal's health. Vishal had been undergoing consolidated treatment since the first week of May 2016. The treatment was supposed to continue till the end of October. Vishal was doing just fine until early this week when he was diagnosed with fever. Patients recovering from Acute Myeloid Leukemia AML – M3 (Blood Cancer) have to be very cautious for at least 2 years after their initial treatment to avoid further complications. The fever took a beating on his overall health and he was admitted to the hospital after he became unconscious. The doctors put him on ventilator and Tuesday evening was one of the worst days for him and our family members. The blood culture report indicated that he had AEROMONAS SOBRI, a kind of bacteria in his blood. Vishal is off the ventilator at the moment, but he will be discharged only after a couple of blood tests. In lay man terms, he will now be treated for the latest complication and after a month's will his consolidated treatment will continue which would be for another two months. We must say that in addition to the doctor's treament, it is god's grace and all your blessings and well wishes that have helped him fight this battle. But we must say that he has a long way to go. We hope that you continue to pray for him. Here is the update with regard to Vishal's health. Vishal has undergone and is continuing his consolidated treatment. He was on his second phase of treatment from the 26th April till 24th may. He had to visit the hospital 5 days a week. Every day he was treated with chemotherapy twice a day and 250 ml of magnesium drip. He was advised to take bed rest and consume 10 tablets every day. He has been admitted to the hospital on 21st June for his consolidated treatment again. A blood test is being conducted on Vishal every alternate day and thankfully with all your blessings and god's grace, the results have been showing positive signs of recovery. He has gained weight which according to the doctors is a really good sign. Thanks a lot for your prayers and support.